Sierra FoodWineArt magazine is circulating its winter issue, promoting Nevada City, Grass Valley and Nevada County — in a free, full-color glossy magazine and digital edition that reaches Bay Area, Sacramento and Reno readers. With a theme “Coming Together,” the magazine honors a spirit that defines our region. Examples include fundraising for victims of the Camp Fire; the Resilience IPA beer campaign; dedicating a walkway in downtown Grass Valley in honor of U.S. ambassador Chris Stevens; and launching a “Goat Fund Me” campaign in Nevada City to help prevent wildfires. 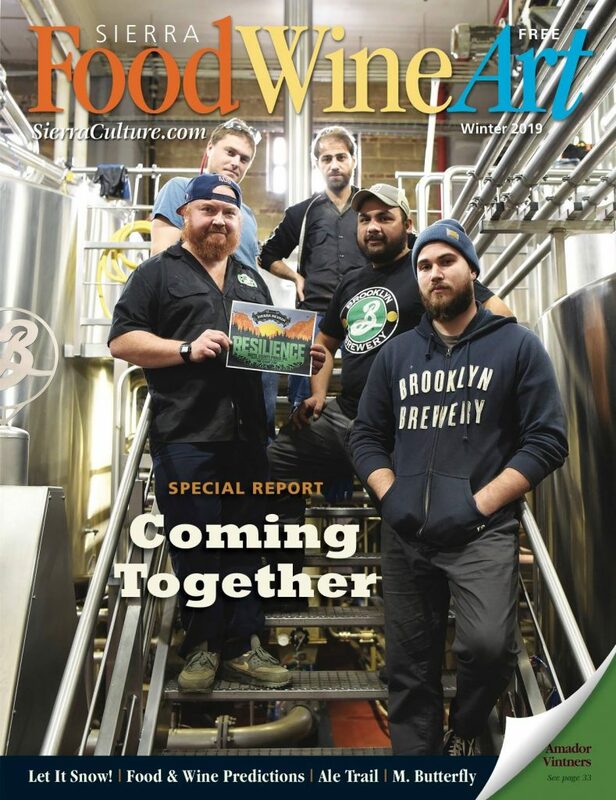 The issue highlights Nevada City businesses including Nevada City Winery, Lefty’s Grill, Golden Era Lounge, ol’ Republic Roadhouse, Jernigan’s, Three Forks Bakery & Brewing Co., Wheyward Girl Creamery, the Ham Stand, and LeeAnn Brook Fine Art, among others. We also write about the city’s Winter Farmers Market, Mardi Gras, Chinese New Year Festival, and performances of “M. Butterfly,” “Hand to God” and “Cabaret” at the Nevada Theatre. Sierra FoodWineArt is distributed all the way to the Bay Area, Sacramento, Reno, Truckee-Tahoe, Chico and Placerville and points in between. It has the most comprehensive digital edition among our region’s magazines, including a “scrollable” format for smartphone users. Owners Jeff and Shannon Pelline are Chamber members and Nevada City residents. For more information, email info@SierraFoodWineArt.com.